PayTV provider in Nigeria Kwesé TV has partnered with 9mobile to bring affordable, premium content to audiences across Nigeria; just like it partnered with MTN NG 7 months ago. You’ll recall that sometimes in February 2018, Kwesé TV acquired the biggest stake in iFlix, a Subscription Video on Demand (SVoD) provider that has millions of subscribers. 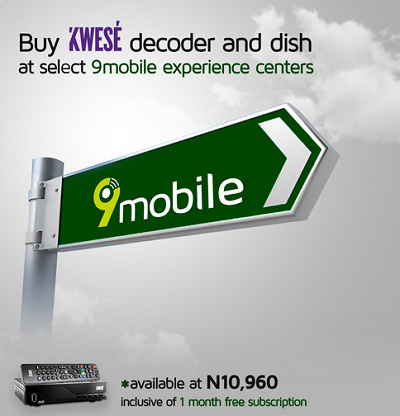 You can buy Kwese decoder and dish at selected 9mobile experience centers in Lagos; Palms, Adeola Odeku, Ikeja Mall, Mushin, Surulere, Festac experience centers. How Much is Kwese Satellite Dish? For those of you who are just hearing about Kwesé TV for the very first time, you can read 7 things you should know about them. What About Their Subscription packages? Kwesé TV offers ‘pay-as-you-watch’ subscription packages. 3 days (N1690), 7days (N1,850 ) and 1 month(N6,275). Let me guess? MultiChoice is no longer scared of Kwesé pay-tv market dominance in Nigeria since TStv has been completely dislodged. Nice one. But its expensive. 6,275 is the same is the same as dstv. How I wish ntel network is fast like b4. I would prefer to use their subscription with android tv box instead of all this decoder.